Flex Seal Liquid is liquid rubber in a can. It starts as a thick liquid that can be brushed, rolled, dipped or poured onto anything and turns into super strong flexible rubber. This rubber in its hardened form can be used in a multitude of ways in your basement, swimming pool, chimneys, roofs, gutters, etc. The rubber once dry is capable of keeping out air and moisture, prevents rust, corrosion and can be painted any color to fit right into its surroundings. The company that makes the liquid, Flex Seal, claims that the product is versatile, non â€“ hazardous, food safe and helps to stop noise and vibrations. It is also UV, Mildew and Chemical resistant hence keeping out unwanted elements when applied to your roof, garage or other surroundings and ensuring that it is safe around children. The cost of Flex Seal Liquid is $19.99 plus $9.95 shipping, for a total price of $29.94. In its liquid form, Flex Seal can be applied to any surface using a brush or it can be poured into any crevice. The rubber when dry will hold its structure against the elements like air and wind. If used in areas susceptible to water and moisture, it will keep them out hence ensuring that problems like fungus and mold will not creep in. When the rubber is dry it can be painted any color that the customer desires. If used inside the house the product will blend in with its surroundings while keeping its true form and maintaining its qualities. Flex Seal Liquid helps keep out elements such as UV rays and chemicals and ensures that the harmful effects are not felt when under its protection. The product also prevents rust and corrosion which helps to secure erosive items. Once the liquid has dried to its final state it keeps its hold in hot or cold weather, however extreme. If poured in a gutter, pipe, or other external areas, the rubber will not be harmed in extreme cold or heat and would protect its surroundings. A coat of the liquid on a roof or gutter helps keep out water, air and moisture while holding its form to prevent the elements seeping in. The roof will also be sturdy and strong while blending in beautifully when painted to the desired color. Easy to apply in tough to reach spots makes the product handy to carry out small repairs to holes and cracks. Rubber utilized here is plant, animal and human safe, which means it can be used to line fish ponds and pools. Flex Seal will create a waterproof barrier around the pool or fish pond and also help prevent rust and erosion to the surrounding. The rubber can be painted blue to reflect a beautiful color in the pool. A thin coat of the rubber on the base of tools and sporting equipment like hammers or baseball bats can provide a nice grip to the tools while also preventing damage from water and rust. Pouring the liquid into the foundations of the house or in the basement can help provide a strong base and create a waterproof layer for the house. The liquid can help prevent moisture in the basement which would help keep out fungus in one of the most vulnerable areas of a home. A thin layer of the product can be applied to help repair auto and RV components. It could also be applied to a ship or sail boat to help repair it and keep it watertight. Flex Seal Liquid uses an inventive method to provide liquid rubber in a can. Once the liquid is applied to a surface, a chemical reaction begins which helps it solidify in its surrounding mould. The rubber once in its solid state will retain its shape and state against all forms of external pressure. Since it is in a liquid state, it can be poured, rolled, brushed or dipped in and the product will then take the desired shape. The rubber works much like water in the way it takes shape and much like ice in the way it is formed. That being said, the product, unlike ice, will retain its qualities when subjected to heat or cold. Once the black Flex Seal Liquid has dried and acquired its shape, it can be painted any color that is desired by the user. Flex Seal Liquid is available in three sizes â€“ Large ( 16 Oz ), Jumbo (32 Oz) and a Gallon. Once bought, the liquid can be stored for a long period of time without fearing spoilage or wastage. To use the product simply brush, pour, roll or dip as required. The liquid can be brushed onto any surface, poured into any crack, crevice, hole or mould. It can also be rolled on a surface using a stick. Equipment like hammers can simply be dipped in the product and a coat will cling to the surface to dry off automatically. Once it has been brushed, poured, rolled or dipped simply wait for the magic to take place. The liquid reacts automatically with the surroundings and voila, you have a versatile, flexible and sturdy coat of rubber that will last a long, long time. 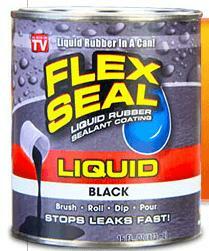 The Flex Seal Liquid is available in black color but, remember, it can be painted any color desired. Simply wait for the liquid to dry off after which you can go ahead and paint it like any other surface or any other material after which it blends into its surroundings. Flex Seal Liquid is a versatile product that can take care of several needs and problems around the house, office, garden or car. It is an easy to use, environmentally and physically safe product that can be used around plants, animals and children. The liquid state means that applying it is as easy as ever, simply pouring it or brushing it into any nook and cranny that would otherwise be difficult to reach. An added advantage of being able to paint it means not having to worry about a black piece of rubber standing out in the middle of somewhere it otherwise wouldnâ€™t belong.